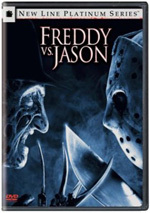 Friday the 13th Part VI: Jason Lives appears in an aspect ratio of approximately 1.85:1 on this single-sided, double-layered DVD; the image has been enhanced for 16X9 televisions. Though generally good, the transfer didn’t quite excel. Sharpness seemed fairly positive. Much of the movie showed nice clarity and definition. However, wider shots tended to be less well-defined and could seem a bit blocky. I witnessed no problems with jagged edges or shimmering, and I also saw no signs of edge enhancement. Print flaws were absent. The movie looked grainy – though not as bad as its predecessors – and that was it; specks, marks and other defects failed to appear. Lives went with a palette that seemed bright for a Friday movie, but I can’t complain about the reproduction of those tones. The colors consistently looked positive. No particular hues dominated, as the movie presented a broad and vivid spectrum of colors that were solid. Blacks also seemed tight and deep, while shadows appeared smooth and taut. The softness was the main reason this ended up as a “B”, but it was still the most attractive Friday film to date. During its theatrical run, Lives boasted an “Ultra-Stereo” soundtrack. That was essentially the same as Dolby Surround, but since it was the first Friday to stretch beyond mono, it was an improvement on its predecessors. This audio got reworked into a Dolby Digital 5.1 remix for this DVD. The soundfield created a good sense of setting. Music offered solid stereo imaging, while effects spread neatly and cleanly across the front. They blended well and brought about a smooth impression. Surround usage didn’t stand out as exceptional, but the rear speakers added dimensionality to the proceedings and were reasonably active. Based on my comments about the 2004 release, it might appear that the older disc offered superior visuals. And perhaps it did, but because I can’t directly compare the two, I can’t state this with certainty. I think audio is a wash between the two, as the new disc’s 5.1 track essentially just replicates its predecessor’s “Ultra-Stereo” mix. We find an array of new supplements here. Although the 2004 disc included a good commentary, it gets replaced with a new one here. In this audio commentary, we hear from writer/director Tom McLoughlin, editor Bruce Green and actor Vincent Guastaferro. All three sit together for their look at cast and performances, some character/story issues, sets and locations, gore and effects, MPAA concerns, music, sound design, and a few other production areas. The 2004 disc included a very good commentary from McLoughlin on his own, and I wish Paramount had provided it here. The new track works fairly well, but it’s not as good as McLoughlin’s solo discussion. This one throws out a fair amount of useful information but it tends to drag at times and never becomes particularly involving. Though I think it’s a decent commentary, the 2004 chat works better. Once again, we find a chapter of Lost Tales From Camp Blood. The seven-minute and 16-second “Part 6” continues the series, but it doesn’t improve on its predecessors. The newest short is just as forgettable as the others. 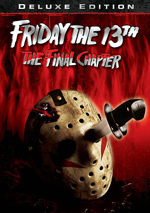 Another continuation comes from The Crystal Lake Massacres Revisited – Part III. As with the first two chapters, this nine-minute and 34-second piece looks at the movie events as though they really happened. I liked the first two, and “Part III” offers another fun and interesting “alternate reality”. Next we find a collection of Slashed Scenes. This six-minute and four-second reel simply offers longer, gorier versions of sequences already found in the movie. We do get a bit more from the film’s ending, though; that’s the most valuable part of this otherwise less than enthralling compilation. 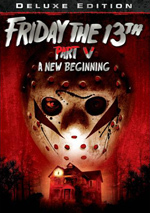 Jason Lives: The Making of Friday the 13th: Part VI runs 12 minutes, 56 seconds and involves McLoughlin, special makeup effects artist Gabe Bartalos and Chris Biggs, and actors Bob Larkin, Nancy McLoughlin and David Kagen. The show looks at the premise and tone of the movie, sets and locations, cast and performances, some story/character subjects, various effects and MPAA concerns, stunts, and the movie’s reception. Inevitably, we hear a few tidbits repeated from the commentary. Nonetheless, “Lives” throws out a lot of unique material. Despite its fairly short running time, it offers a good collection of notes. For the final featurette, we find the two-minute and 45-second Meeting Mr. Voorhees. Loughlin introduces a story reel that shows us an alternate ending in which we meet Jason’s dad. It’s not the most interesting scene, but I like the concept; it’s too bad none of the movies ever dealt with the concept of Jason’s father. A Preview for The Uninvited opens the disc. We also get the theatrical trailer for New Beginning. 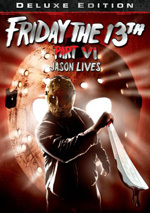 One of the series’ weakest efforts, Friday the 13th Part VI: Jason Lives feels like an awkward attempt to make it something it’s not. It looks as though they wanted to give it more of a Nightmare on Elm Street vibe and seems too goofy and inane to deliver the requisite scares. The DVD presents generally good picture and audio plus some decent extras. Fans will be reasonably happy with this release, but I think it’s a rotten movie.